Concession tickets require a valid Australian Government Concession card to be shown at the gate. Batlow, a Snowy Valleys town, is half way between Sydney and Melbourne and an easy drive from Canberra. It enjoys fresh mountain air, spectacular scenery, and occasional dustings of snow; perfect conditions for growing Australia’s best-known apples - ones that make great cider! 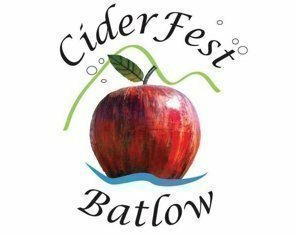 Batlow CiderFest is on the Third Saturday of May and attracts thousands of visitors with its fabulous autumn weather, enthusiastic volunteers, colourful costumes and great entertainment. An extensive selection of Australian and local craft ciders, local beers and wines will satisfy your thirst, and tantalising cuisine will keep your taste buds wanting more. Come the day before! Join in the “Back to Nature” conference and hands on workshop; or enrol in a “Taste and Learn” session where experienced craft cider makers will guide you through the world of real craft ciders. Those attending the “Taste and Learn” session are included in “InCiders” – where cider makers mix to share their produce, stories and ideas with each other and sponsors over a few tastings, canapes and entertainment. On Sunday join our local Hand-Crafted cider makers on cidery and orchard visits (tickets sold at the gate); or learn about Dowsing and try it yourself. Stay that extra day or two, sleep-in and lunch in the local club or hotel, not to mention the nearby wineries and cafes. - Back to Nature conference / workshops at 9am - 4pm. - Craft Cider: Taste & Learn + InCiders at 2:30pm - 7:30pm. - Batlow CiderFest Street Party at 10:00am - 4:30pm. - Dowsing at 1:00pm - 4:00pm. For full details of what’s on offer, accommodation and transport visit the Batlow CiderFest website at www.batlowciderfest.com.au. Go with the Flow! Plan your visit now! Please print your ticket/s or show on your smartphone and present on arrival for scanning.